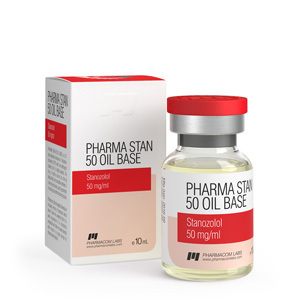 Pharma Stan 50 Oil Base (Stanozolol, Winstrol) PharmaCom Labs Balon 10 ml (50 mg / 1 ml). Pharma Stan 50 Oil Base universal steroid drug with a high anabolic index. The active ingredient is stanozolol. The substance was developed in 62 year of the 20th century. Originally used to increase horse power. Later, the drug passed, clinical trials and additional research and began to be used in medicine. With the help of anabolic, they successfully fought against diseases of bones and joints, used in the treatment of patients with anemia and low immunity. After the release into the free market, the athletes became interested in the security forces and began to actively apply in bodybuilding. The peak of popularity of this steroid fell on the 90s, when sport became an everyday lifestyle. Pharma Stan from PharmaCom Labs has been developed on a water basis, which significantly reduces pain during injection and relieves from side effects. Suitable for use by novice athletes and athletes with long experience of using anabolic steroids. Girls need to consult a doctor or trainer before use. If you do not have the opportunity to consult with experts call us toll-free. Pharma Stan 50 Oil Base Benefits. * Increases power and speed abilities several times. * Makes elastic and prominent muscles. * Removes excess fat, tightening the skin. * Promotes drawing of veins and muscle fibers. * Increases stamina, allowing you to increase workout time. * Accelerates blood formation, saturating the body with nitrogen. * Reduces the level of globulin in the blood. * Promotes an increase in the activity of other hormonal drugs. * Strengthens the skeletal system. * Improves the mental attitude. In amateur sports, the drug is used quite often and, subject to all the rules of application, it gives an enormous result. Girls often use anabolic for weight loss and improve the quality of training. Professionals should consider the duration of the substance in the body for at least 7 months. If, however, the athlete chooses to use the agent before the competition, masking agents will be required. You can use the oral form. Unlike the injectable form, it is present in the body for only 8 weeks. Before the first acquaintance with this drug, you need to be tested for hormones and consult with a number of specialists. Keep in mind that stanozolol does not affect muscle gain. Dosage for beginners and amateurs is 20 mg per day. Athletes chemists can increase the dosage to 50 mg per day. Girls should not exceed doses of more than 20 mg per day. Standard course no more than 8 weeks. Can be combined with methane, testosterone, nandrolone. After a course of three days, rehabilitation therapy should begin. To achieve maximum results, you need stick to a diet and exercise. Without training, the drug is ineffective and will not bring visible results. To normalize the diet, sports doctors recommend replacing part of the food intake with sports supplements.